DVR PRO Series DIY Hidden Spy Camera Kit - Make almost anything into a hidden camera yourself! 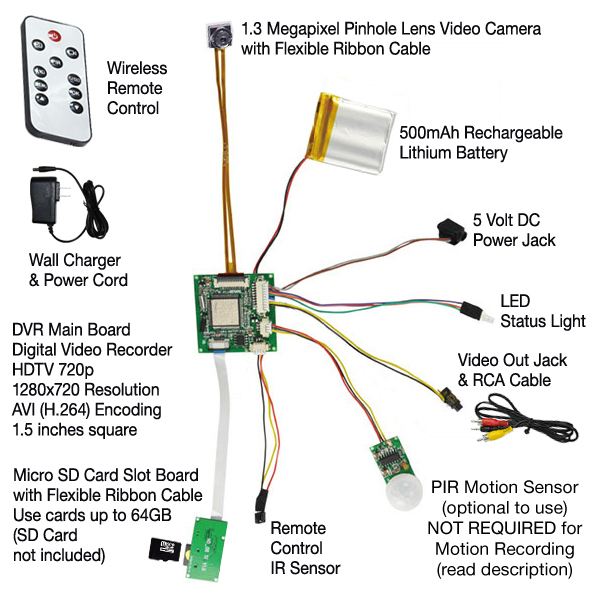 The camera, power jack, video jack, IR remote sensor, PIR motion sensor, status LED, battery, and the Micro SD Card Slot are all connected to the main board with long flexible cables. Having each component separated makes it much easier to mount the camera and each component where it is desired. 1.3 MegaPixel CMOS Camera with 1280x720 Video Resolution delivers a true pro-grade image in conjunction with the built-in DVR that features H.264 video encoding for the best video quality possible. It can be used as a normal video camera or security camera. Built-in mounting points allow you to attach it with to any surface using small screws or other mounting hardware (not included). The camera is smaller than a fingernail and attaches to the main board with a flexible ribbon cable. It has a pinhole lens with a wide field of view. Only the pinhole lens needs to be exposed. The camera could be further concealed by placing it behind other items with a just a small hole for the lens to see through. Advanced DVR recording functions with on-screen-setup menus make it easy to configure the options. The video is recorded internally to a removable Micro SD memory card (sold separately). Works with up to 256GB Micro SD cards. Video storage is approximately 2.5GB per hour of video recorded. NEW! PIR MOTION MODE + SUPER LIFE BATTERY = BATTERY POWER FOR UP TO 100 DAYS! Using PIR motion sensor mode and the (optional) Super-Life built-in battery the PRO Series model will work for up to 100 days in standby mode with the reserve power to record up to 12 hours of video when motion is detected. It works for that long because the camera/recorder remains in a powered-down state until body heat and movement is detected. This saves an incredible amount of battery power compared to video-motion mode. When using this mode is there is a a brief delay from when motion is detected until recording starts because the camera must power-up before recording can begin. Control recording modes, start/stop recording manually, plus access on-screen menus and other functions. Includes an analog video output with a mini video jack and mini-jack to RCA cable that when connected will show the live video and on-screen feature menus or playback recorded video files on a regular TV. The video files are recorded as AVI (H.264) so they can be viewed on almost any PC, Mac, or other devices using popular free software like Windows Media Player or Kmplayer and they can be easily edited by most video editors. Simply remove the Micro SD Card you are using to transfer the files. This kit should only be purchased or used by persons that are completely familiar with the proper handling, installation, and use of circuit-board level components. The camera ribbon cable and other components of this item are very fragile. This item may be easily damaged by impacts, electric discharges, static electricity, and short circuits caused by conductive objects or liquids coming into contact with the components. Parts of this item will generate heat during charging and during normal operation. This item should not be installed or used in any enclosed area without adequate venting and/or heat sinks. The use of incorrect power supplies, batteries, chargers, or other power sources may cause overheating and/or permanent damage to this unit. These component items are "unfinished goods" in kit form. This item is sold "AS-IS"